Successfully Added 4 Port GSM Smart Switch Plug Socket - 110 To 245V, 10A, GSM SIM, Antenna, Temperature Sensor Interface to your Shopping Cart. Switch almost any appliance on and off remotely with this GSM smart switch socket. Deter burglars, control alarms, generators, heaters, sprinklers, video equipment, motorized gates doors and pet feeders all from your phone. 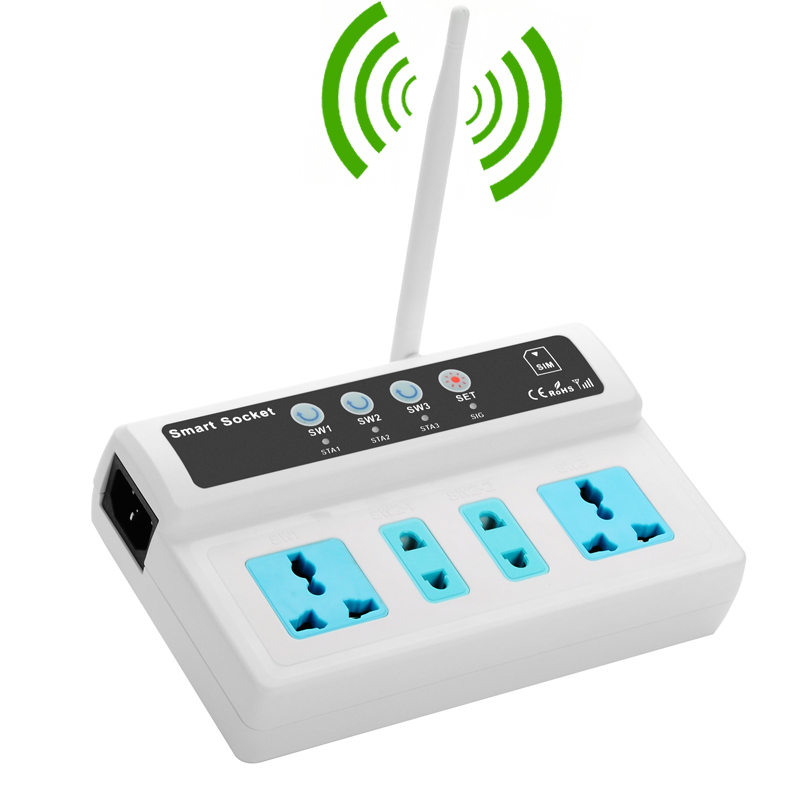 With two universal 3 pin sockets suitable for US, EU, UK and South Africa as well as two 2 pin sockets suitable for EU and south African plugs this 4 socket GSM smart adapter . Rated to 2000W and operating on 850, 900, 1800 and 1900MHz frequencies this Remote controlled power socket works around the globe and offers control of multiple electric devices via SMS messages. Using the SET button you can manually set the control numbers while with the SW1 to SW3 buttons it is possible to activate each socket allowing for details remote controls. A temperature sensor interface allows you to connect a sensor (not included) to detect the room temperature, great for controlling heating systems, air con units, opening motorized windows and a host of other industrial or household applications. This Smart GSM 4 Socket plug adapter comes with a 12 months warranty, brought to you by the leader in electronic devices as well as wholesale smart home gadgets..
SW Button: Control switch state, the state overturned after press. SET Button: Press the SET button, you can manually set the controller number. STA Indicator: The current status indicator, if the device is connected, the light will be on, and if status is disconnected, the light goes out. SIG Indicator: GSM signal indicator, flash for four seconds to enter the GSM network.